These July-August drop White Suffolk cross lambs weighing 19.4kg cwt sold for $137.50 at Gerogery, NSW, on AuctionsPlus last week. FEWER buyers were found for a reduced online offering of sheep and lambs on AuctionsPlus last week. AuctionsPlus offered 81,690 sheep and lambs last week, 3781 fewer, but the clearance rate dropped to 52 percent in the face of the continued hot and dry conditions. The states hardest hit by continuing dry conditions offered more sheep and lambs; New South Wales up 922 to 52,470; South Australia 4504, up 1224, and; Queensland 15,000, up 7753. Victorian producers offered 14,013 head, down 4969, and Tasmania agents offered 276 head, 4750 fewer. Merino ewe numbers increased by 9550 to total 31,045 head, of which 52pc were sold. Merino ewe hoggets averaged $152 and sold from $110 to $181. The top price was achieved by a line of 240 ewe hoggets at Harden, New South Wales. The 17-18 month-old Hazeldean blood hoggets weighed 50.3kgs, were mostly score 3 in condition and were late November shorn. They were bought a buyer at Nubba, NSW. Grown Merino ewes sold from $65 to $190 and averaged $129. A Goulburne, NSW, buyer paid the top price for 375 unjoined 4.5 year-old Cottage Park blood Merino ewes at Cooma, NSW. The ewes weighed 62.5kgs, were mostly score 3 and were late May shorn. A line of 470 2.5 year-old mid-May shorn Merino ewes at Walgett sold for $181. The unjoined ewes weighed 63.8kg and were mostly score 4. Merino wether lambs totalled 5,875 head sold, selling from $65 to $121.50 averaging $82, down $4. The top price was paid for 219 June/July drop wether lambs at Goolwa, NSW. These mid-December shorn lambs weighed 43.8kgs and were mostly score 2. A line of 510 26-28 month-old mid-December shorn Merino wethers at Ararat in Victoria sold for $130 to a NSW buyer at Deniliquin. The wethers weighed 64.2kg and were mostly score 2 in condition. 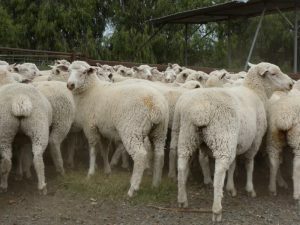 Border Leicester/Merino ewes and ewe lambs sold from $120 to $240, averaging $165.50. A buyer at Wellington in NSW paid the top price for 202 unjoined March 2018 drop ewe lambs at Mendooran, NSW. The unjoined early November shorn lambs weighed 60.5kg and were mostly score 3. A line of 165 30-40 month-old White Dorper ewes scanned in lamb to Dorper rams sold for $171 at Ungarie, NSW. These 64.9kg ewes were bought by a buyer at Parkes, NSW. Store lambs sold from $65 to $137.50 and averaged $100. The top price was paid for 221 July/August 2018 drop White Suffolk cross lambs at Gerogery, NSW. The unshorn July/August drop lambs weighed 42kg lwt or 19.4kg cwt and were mostly score 2 and 3 in condition. A line of 450 mid-November shorn July/August drop Poll Dorset cross lambs at Wallendbeen in NSW sold for $135.50. The lambs weighed 39.6kg lwt or 17kg cwt and were mostly score 3.